PE0256. THE ARCADIANS (Lionel Mockton & Howard Talbot, w.lyrics by Arthur Wimperis), w. Florence Smithson, Phyllis Dare & Alfred Lester (from Original Cast); Supplementary Material by Charles Handy, Violet Essex, Harry Thornton, Peter Dawson, Ernest Pike, Harold Wilde, Stewart Gardner, Edison Light Opera Company, etc. (England) Palaeophonics 120, recorded 1909-29, w.Elaborate ‘The Play’ 20pp. Brochure replete w.photos from the London production & biographies. Produced at the Shaftesbury Theatre, London, 1909 (809 performances); Liberty Theatre, Broadway - 17 January, 1910 (136 performances). "This really funny musical comedy has a very large soft part in the heart of the play-going community. Put on a piece that will make the house rock with laughter, such as THE ARCADIANS, and success is assured! The supply of humour is divided chiefly between Mr. Dan Rolyat and Mr. Alfred Lester, artistes with entirely different styles, so that there is no clashing. The grotesque clowning of the one is as funny as the dry complaining of the other. Miss Phyllis Dare does everything that is expected of her; she dances nicely, sings sweetly and looks pretty, and a musical comedy star need do nothing more. Miss Florence Smithson brings a beautiful voice into play, her singing being quite a feature of the performance. THE ARCADIANS is playing to full houses at every performance and there is, as yet, no talk of a successor. The public will not soon grow tired of such fare, and I heartily agree with their taste." - Playgoer and Society Illustrated, Dec., 1909. “THE ARCADIANS is an Edwardian musical comedy styled a ‘Fantastic Musical Play’. The story concerns some idyllic Arcadians who wish to transform wicked London to a land of truth and simplicity. First produced by Robert Courtneidge, the musical opened at the Shaftesbury Theatre in London, on 29 April 1909, and ran for 809 performances. This was the third longest run for any musical theatre piece up to that time. The production starred Phyllis Dare, Dan Rolyat and Florence Smithson. A Broadway production opened in 1910 and ran for 193 performances, and the piece was toured extensively, and revived professionally, in Britain. A silent film version was made in 1927, and the piece was popular with amateur theatre groups, particularly in Britain, through the 20th century. Recordings of some of the numbers were recorded in 1909 and 1915 by original members of the London cast. Arcadia, a legendary land of rural perfection peopled by beautiful virtuous innocents, first described by the Ancient Greeks, was a popular setting for writers of the 19th century, notably W. S. Gilbert (in HAPPY ARCADIA and IOLANTHE). The development of aviation and flying in the early years of the 20th century captivated the public's attention. Writers fantasised about the strange adventures that might befall those who ventured to travel by the new-fangled aeroplane. A forced landing, perhaps, in some long-forgotten land where time has stood still. The story concerns some idyllic Arcadians who wish to transform wicked London to a land of truth and simplicity. By 1909, Lionel Monckton and Howard Talbot had each had met considerable success writing songs and scores for Edwardian musical comedies. Monckton had contributed to many hit George Edwardes shows, including THE GEISHA and OUR MISS GIBBS, and written complete scores to successes like A COUNTRY GIRL and THE CINGALEE. Talbot had a monstrous hit with A CHINESE HONEYMOON and had written such other long-running musicals as THE GIRL FROM KAYS. He had worked with writer Alexander M. Thompson and producer Robert Courtneidge previously, including on THE BLUE MOON. 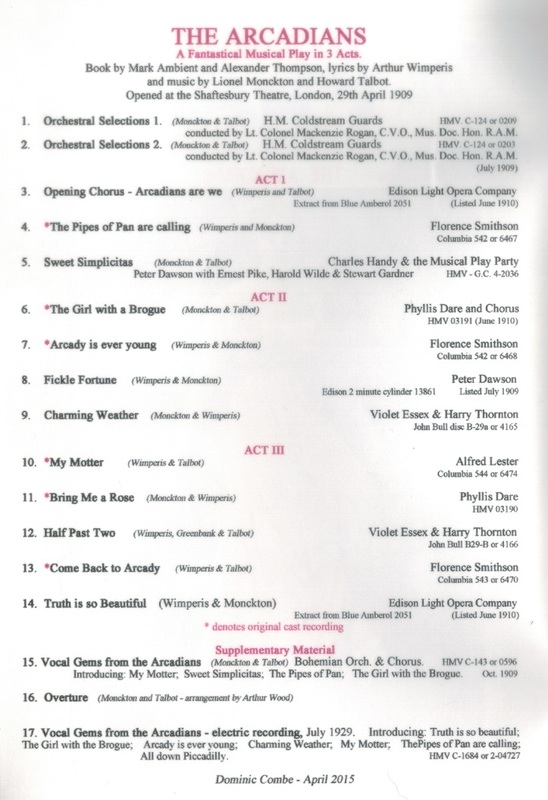 Historically, musically and dramatically, THE ARCADIANS and the other Edwardian musical comedies sit between the fading world of British comic opera, like the Gilbert and Sullivan works, and the later styles of musical comedy and music hall. THE ARCADIANS particularly illustrates this, with the innocent Arcadians representing the older style, and the brash Londoners embodying the new. “Florence Smithson was an actress and singer celebrated in Edwardian musical comedy. In her early career she was an opera singer. She was spotted by the impresario Robert Courtneidge and recruited for his productions in the West End of London and on tour, most notably the hit musical THE ARCADIANS. She was known for the purity of her soprano singing voice. She made her stage début at the age of three in pantomime. After leaving school she studied at the London College of Music. Various singing engagements followed, and while she was touring with a small opera company in LA FILLE DU RÉGIMENT, she was spotted by the impresario Robert Courtneidge. Under his management she toured in 1904–05 as Nanoya in THE CINGALEE and Chandra Nil in THE BLUE MOON. In August 1905 she made her first appearance in the West End repeating her role in THE BLUE MOON and making an immediate success. From then until the First World War she made occasional variety appearances and played in a series of musical comedies. The latter included THE DAIRYMAIDS, TOM JONES, THE ARCADIANS (in which she created the role of Sombra), THE MOUSMÉ, THE SLEEPING BEAUTY, AN INDIAN ROMANCE and THE SLEEPING BEAUTY RE-AWAKENED. One of her last engagements was in a national tour of THE GIPSY PRINCESS. She had a singing voice of great purity, and audiences waited expectantly for her trademark pianissimo high notes. The operatic star Adelina Patti dubbed her ‘the Nightingale of Wales’. 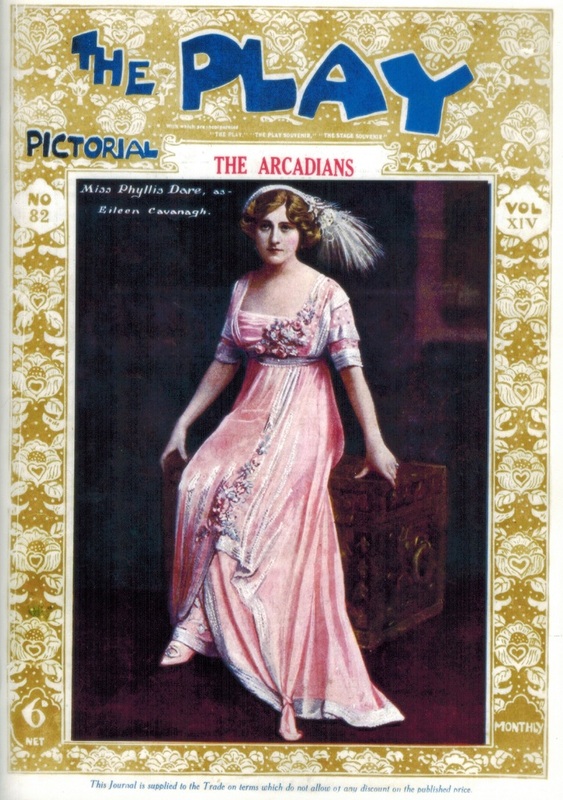 In 1909, Phyllis Dare created the role of Eileen Cavanagh in the hit musical THE ARCADIANS at the Original Shaftesbury Theatre. This was an extraordinarily long-running musical, playing for 809 performances, and Dare stayed for the entire run. The musical marked the beginning of Dare's association with producer George Edwardes, and she went on to star in several more of his productions in the next three years, including THE GIRL IN THE TRAIN at the Vaudeville Theatre (1910, as Gonda van der Loo), PEGGY at the Gaiety Theatre (1911, as Peggy), THE QUAKER GIRL IN PARIS (1911, as Prudence) and THE SUNSHINE GIRL at the Gaiety and then on tour (1912-13, as Delia Dale). She left THE SUNSHINE GIRL in 1913 to join the cast of THE DANCING MISTRESS, as Nancy Joyce, at the Adelphi Theatre. “Alfred Leslie Lester was an English actor and comedian. Born into a theatrical family, he learnt his craft touring in melodramas, as a young man, but made his reputation as a comedian in musical comedy, music hall and, later, revue. Lester's gloomy stage persona was seen to its quintessential comic effect in the long-running musical THE ARCADIANS (1909) in which he delivered optimistic lyrics in a lugubrious manner. Among his other hit shows were THE NEW ALADDIN (1906), HAVANA (1908) and THE BING BOYS ARE HERE (1916). His co-stars included George Grossmith Jr., Phyllis Dare, George Robey and Violet Lorraine. "Arthur Wimperis began his working life as a black-and-white artist, and it was not until after the Boer War that he began a writing career. He made his theatrical mark at first as a lyricist, contributing to Robert Courtneidge's production of THE DAIRYMAIDS and to the Seymour Hicks and Ellaline Terriss musical THE GAY GORDONS, before he found major success with his songwords for a second Courtneidge show, THE ARCADIANS. With the coming of the Viennese musical, he found a new area of activity. He adapted a number of such pieces to the English stage, winning a major success with THE GIRL IN THE TAXI and a second good run with the Hungarian musical PRINCESS CHARMING, and he also adapted Julius Wilhelm and Paul Frank's German original as the libretto for the lavish American musical LOUIE THE FOURTEENTH. Wimperis provided musical burlesques and lyrics for THE FOLLIES pierrot show during its period in London, scored two of his most memorable song hits with 'Gilbert the Filbert' and 'I'11 Make a Man of You' in THE PASSING SHOW (1914) and contributed scenarios, scenes and song-words to a large number of other revues. He also put out a number of plays, most of which were adaptations from French or German originals."